TurboTax is one of the most popular online tax preparation and filing services around. During tax season, it’s nice to use great tax software that makes finishing your return as quick and painless as possible. I’ve used TurboTax to do my tax returns for over a decade now. Back when the only option was to buy the software in a store, I was using it. That was before the internet, by the way. Of course now, TurboTax offers online tax software and makes those dreaded tax returns that much easier to finish and file quickly. But how does it stack up against the competition? With TurboTax, you’ll find a range of products that fit the easiest tax return to the more complicated ones. Free Edition – This edition is perfect for filing a simple tax return like a basic 1040, 1040A, or 1040EZ. It’s also a great place to start if you’re not sure which edition you need. You can upgrade as you see fit, once you get to the more complicated sections. One thing to note, only the federal tax filing is free, you still have to pay to file your state taxes. Basic Edition – You get everything in the Free edition plus live phone support if you need extra help. It’s not a big upgrade for the cost (live chat support is included with the free edition). Go for it if you know you’ll need phone support. Otherwise save some money and stick with the free edition. Deluxe Edition – You get everything in the Basic edition plus a step-by-step guide to maximizing your deductions. It’s perfect if you own a home, donate to charity, have education or medical expenses, childcare costs, or just want to itemize your deductions. Premier Edition – You get everything in the Deluxe edition plus this edition gets into investments, rental properties, and estate or trust beneficiaries. It will calculate your investment’s cost basis and help with short and long-term capital gains and losses. It will even help you carryover capital losses from previous years. Home & Business Edition – This edition is perfect for a sole proprietor, consultant, contractor or single member LLC. You get everything in the Premier edition plus all the tax help for business deductions too. It will even prepare W-2 and 1099 forms for any employees in your small business. Business Edition – If your business is more complex, this edition is for you. It’s great for a multi-member LLC, partnership, S Corp, C Corp and more complex estates and trusts. TurboTax will walk you through the setup to customize it specifically for your business needs. Military Edition – TurboTax created this specifically for military members. It’s built to battle the military-related tax issues many service members deal with: state of residency, combat pay, basic pay, uniform deductions, permanent change of station moves, and more. For a limited time, rank E1 to E5 personnel can get the Military Edition free. A personal note – I use the Home & Business edition to handle my business income and expenses. It also helps with my investments too. TurboTax automatically grabs my 1099 from TD Ameritrade and figures out my investment gains and losses for the year. I suspect most people will be fine using the Free, Deluxe, or Premier edition though. 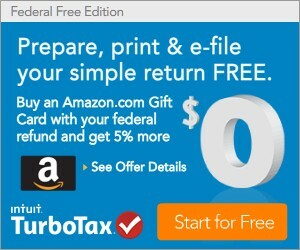 TurboTax Discount – Every year TurboTax offers discounted prices on all paid editions at the beginning of tax season. It’s only for a limited time. Don’t miss out. You don’t need to be a tax genius to use TurboTax. It’s easy to use and there is no chance of getting lost along the way. If you’ve used TurboTax before, getting started each year is easy. All your personal information is grabbed from past returns. The software can even import tax documents from your employer, bank, and brokerage account. One of the best features is the ability to save your work and return later to finish things up. As those W-2s and 1099s show up, you can enter each one on the spot, save it, and eFile your return when you’re done. TurboTax asks you interview style questions as you work through each section of your tax return including personal information, wage and income, investments, and more. It’s thorough enough to cover every possible tax credit and deduction under the sun. You can skip over the credits and deductions you’re not eligible for and if you’re just not sure, TurboTax will find out for you. It even checks and double checks for errors as you go along. When you find yourself staring at the screen not sure where to go, help support is sitting off to the right side just waiting to be used. You can browser through the FAQs and answers. Head over to the Live Community forums and ask a question yourself. There is even free live support through online chat or over the phone. I’ve only used the Live Community option for help. Every time I’ve had a question, it’s already been asked and answered. Which makes it easy to get through my return every year. TurboTax provides a free audit support guarantee. There is always a small chance anyone can get audited by the IRS each year. Having a resource to turn to can be a big help if it happens. You’ll get live audit guidance by phone or online chat, allowing you to ask questions, find out what to expect and learn how to proceed. There is an extra paid service called Audit Defense. I’ve never paid for it. But the service provides full audit representation by a tax professional if you get audited for that year’s tax return. It’s one of those “piece of mind” purchases. If you have a complicated tax return, the extra cost may be worth it. Of course, if it’s that complicated you might want to use a tax professional instead. I don’t know if TurboTax has any major disadvantages. I’ll recommend it to anyone. But tax software only goes so far. The more complex and complicated your return is, the more you should consider hiring a tax professional. Basically, it boils down to your tax knowledge and how much you understand your return. There are some annoyances. You’ll be asked to upgrade…a lot. Even when it’s not necessary. I understand it’s a business, but for the third time, I still don’t need the business edition. That said, now that I start with the Home & Business edition, it doesn’t push the upgrades anymore. Lastly, even though you get the federal eFile free, you have to pay to file a state tax return. Years ago, I did my state return by hand and mailed it. Now, I pay for it out of convenience. This doesn’t impact everyone, but it’s an added cost to those that pay state income tax. TurboTax has fully embraced mobile apps. Now, you can file your tax return right from your phone. Basically, you take a picture of your W-2, fill out a few questions, and eFile through your phone. You can also track your refund and keep track of charitable donations throughout the year. It’s available for the iPhone and Android. You’ll have to use the main TurboTax website if you have other forms. 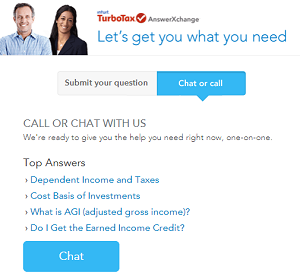 Overall, you don’t have to be an accountant or tax expert to use TurboTax. The user interface keeps things simple. It can handle the simplest 1040EZ to a complicated small business return and everything in between. As a regular user, I highly recommend TurboTax. It’s easy to use and free to try. You can start your tax return now and get a feel for the software. Then save it and come back to finish it later. It will even go through all the complicated tax credits and deductions. If you miss something along the way, just go back and enter the information. It’s that easy.